1) Don't exercise immediately before your session. This needs an explanation because (obviously) warming up before your session is totally fine. Going through an entire workout, or even starting your workout, defeats the purpose of hiring a professional to help you meet your goals. We have a plan. We always have a plan! And we come to every session ready and willing to execute it. One set of biceps curls could throw an entire session off. So if you find yourself waiting for your trainer, err on the side of doing some light cardio to get (or keep) yourself moving. 2) Don't apologize for failing to complete an exercise. Do a new move wrong? Don't apologize for that, either! The client/trainer relationship is very much based on teacher/student methods. We are here to instruct you, and we realize there will be learning curves with certain moves. That's why modifications exist. That's why we break things down. And that's also why we watch you like a hawk. If you try something new, even if you can't do it right or all the way, we'll be proud of you for making the attempt. And we'll guide you toward eventual success. 3) Don't expect immediate results. Personal trainers are not miracle workers. We are guidance counselors, ready and willing to help you find your fitness. We can't predict how long it'll take you to meet your goals, but we can certainly set you up for success. Our job is to push you in the right direction, session after session. Key: "session after session." One session will not get you there, we promise. So don't expect it. Instead, expect to work hard and progress forward. With those expectations, the need for immediate gratification will diminish (and so will your frustrations). 4) Don't compare yourself to others. Every single body is different, and so are the people that own them. Their fitness journeys are not yours. So if the person next to you is doing something you feel you'll never be able to accomplish, don't let it get to you. Instead, let it motivate you! Let it inspire you to work harder, and to get stronger. Because focusing on anything else sends you down to the dumps (and fitness should always make you happy). 5) Don't show up late. We get it, things happen. And we'll be as flexible for you as we can, but here's the thing: We have a schedule—and you do, too. Honor it! Respect the time you've set aside for this journey, because we trainers plan to use it wisely for your benefit. Nutrition is a very important part of your fitness journey. It's also one component we trainers can't really control because YOU are in charge of what you eat. And we aren't necessarily certified to tell you WHAT to eat. That's why we keep registered dietitians and nutritionists in our back pockets. So do what you can to eat a well-balanced diet. Messing around with nutritional trends that aren't backed by science and research and what is right for you can, essentially, work against you in the long run. 7) Don't forget to have fun. We personal trainers do our best to make every session a grand ol' time. Come ready to have fun! If you're in a funk, be up front about it. Let your trainer know so they can motivate you correctly. And if you can, leave the junk in the locker room. Use the time with your trainer to regroup. Focus on nothing but your workout, because only then can you make the most of it—and capture all those feel good endorphins! 9) Don't tell us you can't do something. All we ask is that you try it. If you have a legitimate reason why you can't do something, let's talk about it. Maybe there's a modification, or a way we can tweak things to help you out. Outright refusal without good reason, well..anyone can at least try something, right? Trust us. 10) Don't hide your injuries. Our main goal, no matter what your main goals are, is to keep you safe. If something hurts, previous to or during our sessions together, please let us know! The last thing we want to do is increase your pain or discomfort. And if we don't address either of those, it will ultimately set you back. Question: Certified trainers, what can you add to this list? 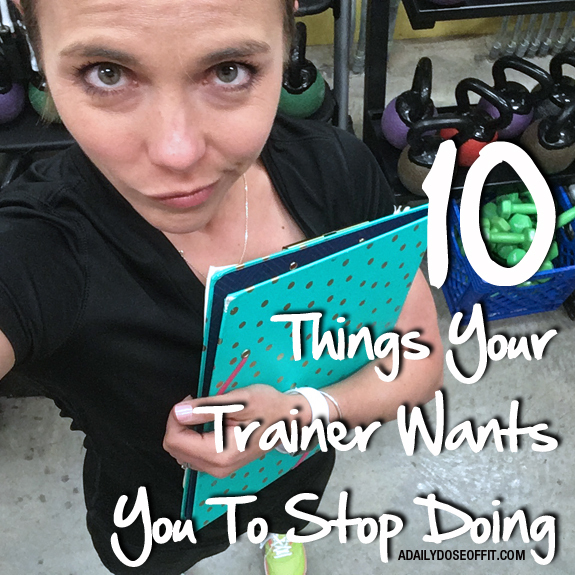 Non-trainers, have you ever worked with a personal trainer? What did you take away from that experience? I also did Alex's Duck Duck Run, which is a big local 5K where I live. It's typically a hot one, so I go into it with little to no expectations. I won my age group last year with a time of 22:36. I won my age group again this year with a time of 23:26. I organized a beer run. 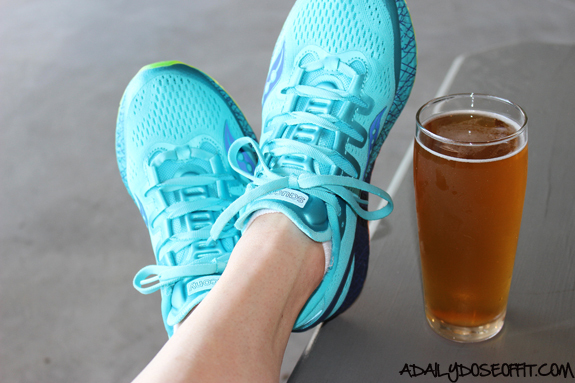 I don't even drink beer, but I manage a running store. So give the people what they want, right? We (the other managing partner and I) threw out the information hoping we'd get a handful of people—we ended up getting over 60 people to show up, which was great because all of the money we collected went to a local charity. We've got another beer run this Thursday night, so we'll see if we can keep the momentum going. I got really busy at work. Two jobs, y'all. Together, they equal one full-time job. I wouldn't trade these jobs for the world because, for the first time ever, I feel like I'm truly doing what I love and it's great. But, man. They keep me busy in the best way possible! From shoe orders and shoe rep meetings at the store, to personal training sessions, classes and admin work at the gym—I'm all systems go all the time. Again, it helps that I love my jobs, but there's little wiggle room for play. And most of that wiggle room is reserved for time with the family. Guys, despite the crazy, I've been doing really well with my "read one book a month" goal for 2017. My latest page-turner was Present over Perfect: Leaving Behind Frantic for a Simpler, More Soulful Way of Living by Shauna Neiquist. And it was really good. I'm sure you can imagine (based on this post alone) how it would speak to me on multiple levels. I highly suggest it. I received another Ellie box. 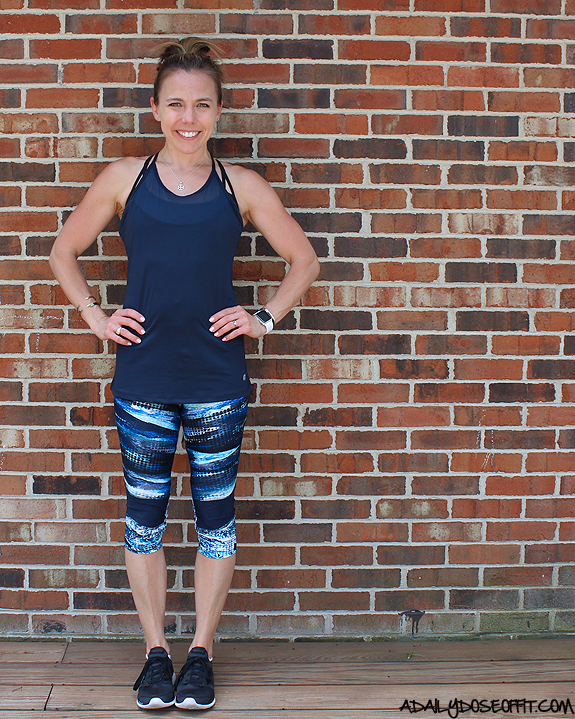 If you live in fitness clothing, you need to check out this fitness subscription service. I have not been disappointed yet...all three outfits have been awesome. $50/month gets you a top, bottom, sports bra and two accessories. This month's accessories (not pictured) were a hat and running belt. $50 might seem like a lot, but you definitely get your money's worth. See the May box HERE. I spent time at the beach. Because #summer. I am so fortunate to live along the shores of Lake Michigan. We made a vow to visit the beach at least once a week this Summer because, well...because we can! Twist my arm, I'm down with beach time anytime. I was featured on two different websites. I feel like there's so much more to tell, but at the risk of boring you, I'll stop right here with a promise to keep sharing. So many post ideas in my head! So little time. Boo. Question: What's one exciting thing you've done so far this month?